You are here: Home / Blog / Wondering when the Country Garden Alphabet is ready? Wondering when the Country Garden Alphabet is ready? Hi, just wanted to give you an update on the Country Garden Alphabet. I am working on it furiously and have it all digitized but am still test stitching half of it. Here is a photo of one of the letters. I think I should have it done by midweek next week – beginning of June. It’s been a lot of fun but also a lot of work. I do hope you will enjoy it as much as I have digitizing it. OH my gosh. That is just adorable! Are you going to offer the lower case on this font? Suzi, what size are you looking for in the lower case. I presume you would like to have “plain” fill letters? I may consider it if there is interest. The applique letters are about 5″ tall. Let me know. 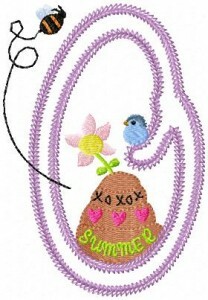 Here at Oma’s Place we offer you quality machine embroidery designs and in the hoop projects. We are known for our detailed and thorough instructions. All of our designs go through a thorough testing process and you can purchase with confidence. Our designs are available for instant download and come in 10 different machine formats. As a Christian mother/son team, we strive to show honesty, integrity, and compassion in our interactions with our customers. We back our designs 100% and are here to help you if needed. Thank you for visiting Oma’s Place. We hope you like what you see and will tell others about us. Join our newsletter to get latest updates, special offer, & embroidery tutorials right in your inbox. 2018 © Oma's Place.com All Rights Reserved. For help please don't hesitate to contact us for support.